Billy Bishop Toronto Centre Airport (BBTCA) is the cause of much noise but justifiable complaints about it don’t seem to have much effect. Indeed PortsToronto is proud of its Noise Management Program. It said as much when it publicized its 2014 ‘annual’ noise report. However, CommunityAIR has voiced concerns about the policies’ effectiveness, in particular with regard to PortsToronto’s Good Neighbour Policy. Another tool in BBTCA’s Noise Management Program is WebTrak 5, a website that allows the public to monitor the airport activity and base complaints on the information the site provides. Interested parties may wish to learn how the program works. The Quick Start Guide in the upper left of the screen offers basic instructions. WebTrak 5 noise monitors show as small circle containing a number. The number is a noise measurement, which will be discussed on a subsequent post. 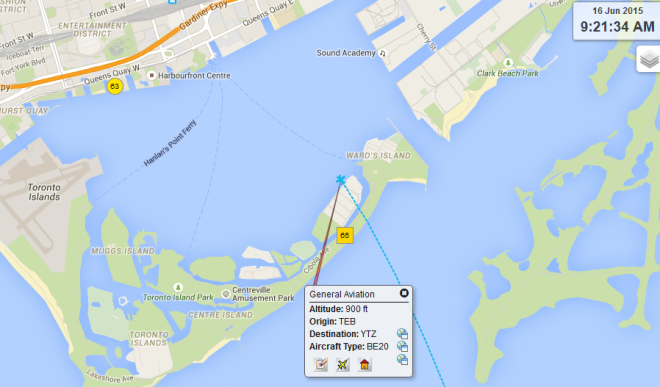 This screenshot dated from WebTrak 5 dated June 16, 2015 shows a general aviation BE-20 Beech King Air 200 over flying the residential area on Algonquin Island, a designated noise-sensitive area, at 900 feet. Even clear evidence of a breach of the Good Neighbour Policy means very little. The Good Neighbour Policy states, “The policy requests that pilots avoid flying over areas identified as noise sensitive, as set out in the Canada Flight Supplement, or that they fly over them at an altitude not less than 1000 feet above ground level (agl). So, what happens about this plane that breached the policy? The Good Neighbour Policy also states, “It should be noted that the Noise Sensitive Areas (NSA), are not restricted air space, and that compliance is voluntary.” BBTCA may send the pilot a be-nice letter but essentially there’s nothing that BBTCA can do to enforce the policy. The BBTCA published complaint statistics for this year would bear out the effectiveness of the policies. Noise complaints increased for 3 out of 4 months this year over last. It’s not hard to believe that Noise Management Programs that have little to no effect are nothing more than a lot of noise.